100 years ago today, a 67-word statement from the British cabinet shaped the future of Palestine. On November 2, 1917, Arthur James Balfour released a statement on behalf of the British cabinet calling for a “national home for the Jewish people” in Palestine. The statement would help shape a century of conflict in the region, signaling the British Empire’s support for the Zionist project. Political Zionism’s ultimate objective, as laid out by founder Theodor Herzl in his famous 1896 booklet, Der Judenstaat, and in his private writings, was as far-reaching as it was crystal clear: a Jewish state, meaning Jewish sovereignty and Jewish control over immigration into Palestine. The Zionist movement began as a colonial enterprise in search of a metropolitan sponsor. Having failed to win over Germany or the Ottoman Empire, its leaders succeeded with Britain’s wartime cabinet. Thereafter, they enjoyed the support of the greatest power of the age, one that would soon emerge victorious from the Great War. But the Balfour Declaration has another, less regarded, aspect — it decided the future of the Palestinian people. For them, this statement was a gun pointed directly at their heads. Whether or not contemporary British statesmen considered it in these terms, it amounted to a declaration of war, launching an assault on the indigenous population by aiming to implant and foster a “national home” at their expense. Palestinians had viewed the Zionist movement with concern since the late nineteenth century, but the Balfour Declaration proved that they now faced a grave threat: at the very moment the statement appeared in London, British troops were advancing through Palestine. The overwhelming Arab majority in Palestine (then around 94 percent of the population) appears only in the most backhanded way, as the “existing non-Jewish communities.” The statement does not recognize them as a people — neither the word “Palestinian” nor “Arab” appear in the declaration. The British government offered this majority “civil and religious rights” but no political or national rights. That is, the Balfour Declaration announced that the Palestinians now faced the eventual prospect of losing control of their nation to the Zionist drive for sovereignty over a country that was then almost completely Arab in population and culture. This prospect may have seemed farfetched at the time, but it became a reality just three decades later. In the years before 1914, many Arabs in Palestine viewed the Zionist movement’s rapid progress with trepidation, especially as Jewish immigration increased. 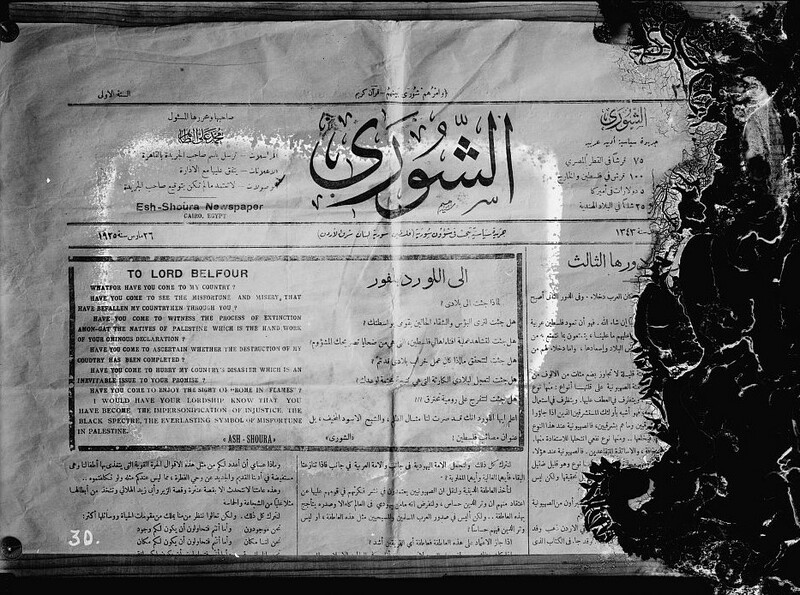 The Arabic-language press documents this anxiety: the Haifa-based paper al-Karmil and Jaffa’s Filastin published over two hundred articles hostile to Zionism in the years before World War I. In areas of intensive colonization, such as coastal agricultural communities and the fertile northern valleys, the peasantry felt Zionism’s advance in more concrete terms. The movement purchased large tracts of land from absentee landlords, and the Zionist doctrine of avoda ivrit (Hebrew labor) often meant that settlers removed the Palestinians who had been working the land. As a result of these sales, many peasants were forced off farms they had seen as theirs for generations. Some of them then suffered in armed encounters with the first paramilitary units that the settlers formed. City dwellers in Haifa, Jaffa, and Jerusalem — the main centers of Jewish population in Palestine then and now — shared their fears. They observed the constant arrival of new European Jewish immigrants in the years before World War I with mounting concern. News of the Balfour Declaration spread quickly in most other parts of the world. In Palestine itself, however, it went virtually unnoticed. This is not terribly surprising, considering wartime developments. For one, local newspapers had been shuttered since the beginning of the war because the Allies’ naval blockade of all Ottoman ports produced a newsprint shortage. As a result, most people in Palestine did not have immediate access to any international news. Then, after British troops captured Jerusalem in December 1917, the strict military regime they imposed banned coverage of the declaration. Indeed, the British authorities did not allow any newspapers to reopen in Palestine for nearly two years. Therefore, Palestinians learned of the Balfour Declaration only later, as information trickled in slowly through Egyptian newspapers that travelers brought with them from Cairo. But less immediate reasons also delayed the declaration’s arrival and initially muted the Palestinians’ reaction to it. From spring through late fall 1917, a grinding series of battles involving trench warfare and intensive artillery bombardments between British and Ottoman forces played out in southern Palestine. The British, under General Allenby’s command, launched a series of major offensives that slowly pushed back the stubborn Ottoman defenders. The fighting spread to the center and north in winter 1917, continuing into the spring of 1918. Heavy British ground and naval artillery shelling during the halting allied advance up the Palestinian coast nearly pulverized Gaza. This offensive involved three separate assaults on the city’s entrenched defenses and its environs, in March, April, and November 1917. The war left the Palestinians exhausted as a result of shortages, poverty, dislocation, and famine. The Ottoman military requisitioned draft animals; a plague of locusts destroyed crops; and draconian conscription measures sent most working-age men to the front. The Ottoman empire in fact suffered the heaviest death toll of any major combatant power, with over three million war dead — or 15 percent of the total population, most of whom were civilians. Some estimates put the number much higher, claiming a quarter of the population died in the course of the World War I. In greater Syria alone, which included Palestine, half a million people died due to famine between 1915 and 1918. Horrific war casualties compounded these civilian deaths. As many as 750,000 Ottoman soldiers out of the 2.8 million originally mobilized may have died during the war. Casualties among Palestinian and other Arab units were very heavy because they often fought on the most contested battlefields. These factors had a massive impact on Palestine. Demographer Justin McCarthy estimates that, after growing about 1 percent annually in the prewar years, Palestine’s population declined by 6 percent during the war. Against this grim background of mass suffering and deprivation, Palestinians learned, in a fragmentary fashion, about the Balfour Declaration. Though all citizens faced pressing concerns as the war wound down, the survivors greeted the news with dismay, whenever and however it reached them. The British occupation, which marked the end of four hundred years of Ottoman rule, intensified the shock of the Balfour Declaration. Political identities in Palestine had evolved in the late nineteenth century in keeping with global trends and with the considerable evolution of the Ottoman state. The empire had started to falter in the pre-World War I era, with territorial losses in the Balkans and Libya, but its dissolution following its crushing 1918 defeat swept away a government that had controlled the region for twenty generations — nearly twice the lifespan of the American republic. This transformation disoriented the Palestinian people, compounding the war’s devastation and the shock of living under the first foreign occupation they had ever known. In the immediate postwar era, Palestinian national identity evolved significantly and rapidly. Indeed, in the wake of a great war driven by the participants’ unrestrained nationalism, the idea of national identity — a quintessentially nineteenth-century phenomenon — took on new importance. This was as true in Palestine and other parts of the Middle East as it was elsewhere in the world. Woodrow Wilson and Vladimir Lenin’s very different calls for self-determination made the issue even more important. Whatever these two leaders’ actual intentions, their apparent endorsement of colonized people’s national aspirations had an enormous impact. Wilson of course had no intention of applying these principles to most of the peoples whose hopes of liberation he inspired. Indeed, he confessed that he was bewildered by the plethora of groups, most of whom he had never heard of, who responded to his call for national self-determination. Nevertheless, as a result of the hopes aroused and then disappointed by Wilson’s Fourteen Points, by the Bolshevik Revolution, and by the Versailles peace conference, Egypt, India, Korea, and many other countries became sites of massive anticolonial revolts in 1919 and immediately after. We can credit the growth of nationalism and its acceleration during and after the war with the dissolution of the Romanov, Hapsburg, and Ottoman empires — three transnational dynastic states that had long repressed their population’s national sentiments. The Palestinians, suffering from a kind of collective post-traumatic stress syndrome as a result of World War I, had to face new realities as they entered a postwar world suffused by nationalist fervor. The Ottoman Empire disappeared, replaced by Britain and France. In 1915-16, these two European powers secretly partitioned the region in the Sykes-Picot accords, a deal that the Bolsheviks revealed to the public in 1917. The possibilities of Arab independence and self-determination — which the British guaranteed to Sharif Hussein of Mecca in 1916 and which became the subject of repeated pledges thereafter — had to be measured against this agreement for a colonial partition. At best, the British kept these promises partially and belatedly for other Arab peoples, but the empire never honored them for the indigenous Palestinian population. While Egyptians Iranians, Iraqis, Syrians, and Turks all achieved a measure of independence in the years after World War I — albeit sometimes highly constrained and limited — the Palestinians had no such opportunity. Instead, the British operated in Palestine with a different set of rules, those rigidly dictated first by the Balfour Declaration and then by the League of Nations mandate based on it. The declaration had been designed to suit the needs of Zionism, a colonizing movement that had allied with an empire whose armies were just then conquering Palestine. British troops would not leave for over thirty years, by which time the Zionist enterprise had become firmly entrenched, fully realizing many Palestinians’ worst fears. As in most of the Middle East and much of Europe as well, the national idea began taking root in Palestine in the latter part of the nineteenth century. However, many see Palestinian nationalism as nothing more than an unreasonable reaction to Jewish self-determination. In fact, Palestinian identity, like Zionism, emerged in response to many stimuli. Ironically, the two movements grew up at about the same time, despite the claims of both modern nationalisms to ancient lineages. Zionism’s colonial project was just one catalyst for Palestinian nationalism, just as antisemitism was only one spur for Zionism. Even before World War I, Palestinian identity included elements of a patriotic modernism, Muslim and Christian religious attachment to Palestine as a holy land, and fear of European encroachment. Later it drew strength from the widespread frustration at the colonial powers blocking the aspirations of Palestinians and other Arabs for freedom. This national sense closely resembles the other nation-state identities that emerged around the same time in Iraq, Lebanon, and Syria — those new states that the European powers, largely on the basis of the Sykes-Picot accords, created out of the wreckage of the Ottoman Empire. Without a doubt, Zionism played an integral role in the Palestinian case, but reducing Palestinian identity to opposition to Zionism ignores the very similar parallel histories of neighboring states. Neighboring Arab peoples — Jordanians, Lebanese, Syrians, and so forth — managed to develop twentieth-century national identities without the dubious benefit of Zionist colonialism. As soon as they could, Palestinians began opposing the British government and the arrival of the Zionist movement as a privileged colonial interlocutor. They did so initially in the shadow of a strict military occupation that lasted until 1920, then under a series of British High Commissioners. The first of these, Sir Herbert Samuel, was a committed Zionist and former cabinet minister who laid the foundations for much of what followed. In understanding the Palestinian efforts to oppose this regime, we must keep two crucial factors in mind. First, unlike most other colonized peoples, the Palestinians had to contend not only with the metropolitan colonial power, but also with the Balfour Declaration’s terms. Thus they had to deal with a settler-colonial movement that, while beholden to the United Kingdom, was also independent of it and enjoyed an international base, which importantly spread to the United States. Second, the United Kingdom did not rule Palestine outright: it did so as a mandatory power of the new League of Nations. When British officials rejected Palestinian protests, they had international legitimacy thanks to the 1922 League of Nations Mandate for Palestine, which had incorporated the Balfour Declaration verbatim and substantially expanded on its commitments. The Palestinians therefore found themselves in a triple bind, which may be unique in the history of indigenous resistance to European settler-colonial movements. They faced a colonizing movement with a national mission and independent sources of finance and power. They also had to confront the might of the British Empire in an era when not one colonial possession, with the partial exception of Ireland, had successfully freed itself from the clutches of European powers. And they had to face the international legitimacy that the League of Nations accorded British rule, with the League effectively sanctifying the Balfour Declaration by endowing it with the approval of the preeminent international body of the day. The Balfour Declaration had ceased to be a statement from the British cabinet and became an internationally sanctioned legal document. This insight is all-important in understanding how the declaration and the mandate structured what happened next. It also partially explains the Palestinians’ failure to overcome their difficult circumstances and retain possession of their ancestral homeland. Before the Balfour Declaration, the Zionist movement was a colonial enterprise without a fixed metropole — an orphan searching for a foster parent. When it found one in the United Kingdom, it could begin colonizing Palestine in earnest. Soon after, it gained strength from the indispensable “iron wall” of British bayonets and the League of Nation’s international credibility. Seen from the perspective of its victims, the declaration’s careful, calibrated prose amounted to a proclamation of war. The Zionist movement waged this war with money, legal means, propaganda, guns, and car bombs, while the British deployed multiple forms of repression, exile, warplanes, artillery, and summary executions. The Balfour Declaration thus marked the beginning of a century-long conflict that continues to this day. Rashid Khalidi is the Edward Said Professor of Modern Arab Studies at Columbia University, and director of the Middle East Institute of Columbia's School of International and Public Affairs.